Communicating thoughts, inspiring ideas, telling stories: When pencil meets paper, these possibilities emerge. For Vito Grippi, possibilities became realities in ways that reach beyond his York hometown. Grippi, an adjunct writing lecturer at York College and York’s poet laureate, recalls his stationery obsession from an early age — he was never one to be far from his fountain pens and notebooks plastered with Nirvana stickers. 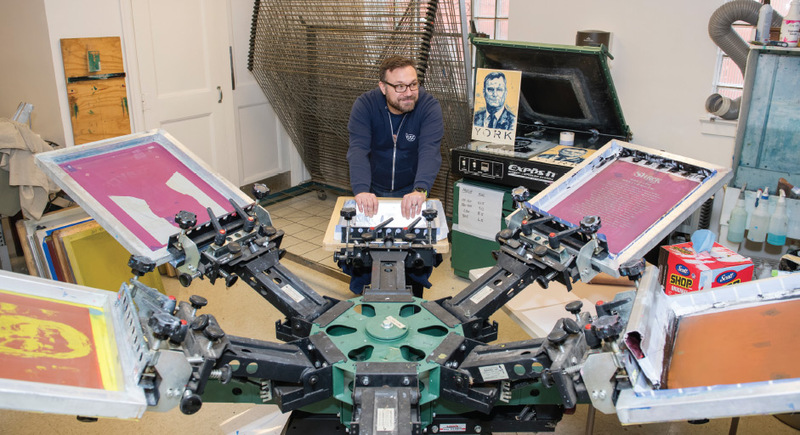 Although he initially entered York College as an accounting major, it was writing that gave him personal fulfillment. “Part of me getting into writing was having that medium to tell a story and develop my voice,” he says. From poetry and song lyrics to short stories, writing became a way for Grippi to connect with others both in his academic studies and his work as a professional creative writer and editor. In 2015, he united a business plan with a social mission. Along with business partner Gabriel Dunmire, he co-founded Story Supply Co., a stationery-arts brand committed to creating and selling high-quality analog tools (such as notebooks and pencils) that help people tell their stories. The company’s signature 3 1/2-by-5 1/2-inch Pocket Staple Notebook — produced with sustainable materials and proudly manufactured in York — created the core of a successful Kickstarter campaign that garnered more than $12,000 in startup funds. 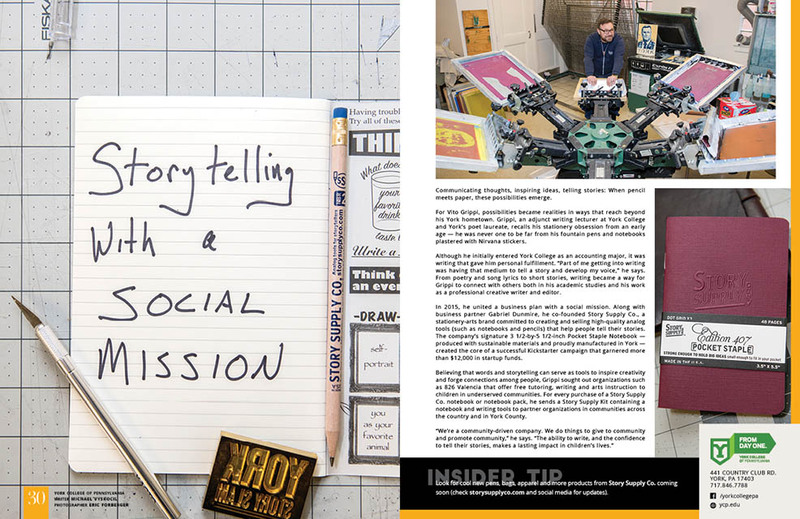 Believing that words and storytelling can serve as tools to inspire creativity and forge connections among people, Grippi sought out organizations such as 826 Valencia that offer free tutoring, writing and arts instruction to children in underserved communities. 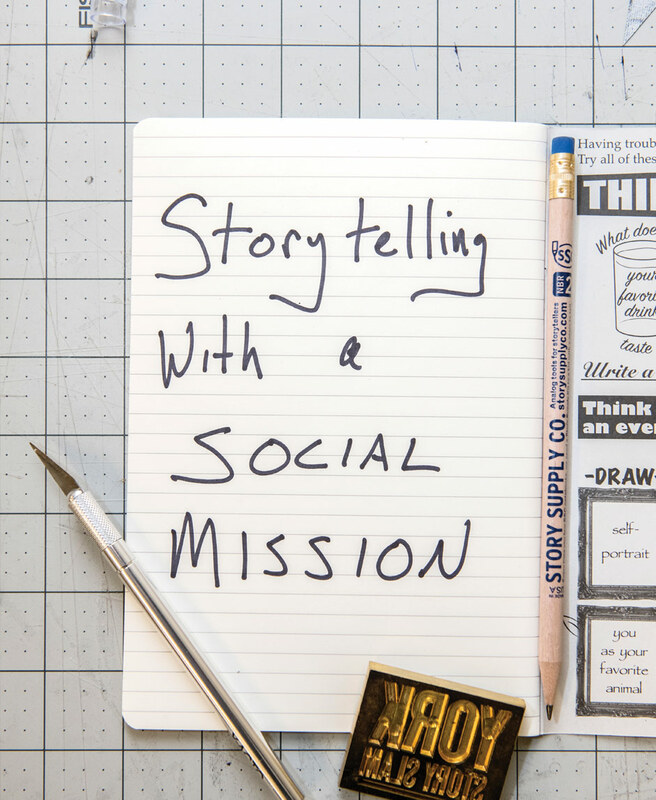 For every purchase of a Story Supply Co. notebook or notebook pack, he sends a Story Supply Kit containing a notebook and writing tools to partner organizations in communities across the country and in York County. Look for cool new pens, bags, apparel and more products from Story Supply Co. coming soon (check storysupplyco.com and social media for updates).